Critical By Design? is a two-day international research conference on the capacity of design as a mode of critique. It offers a unique platform for the interdisciplinary discussion of critical theories and practices from a design perspective. Renowned experts from design theory, history and practice, the philosophy of technology, the art, cultural and media studies as well as the field of human-computer interaction come together to reconsider historical trajectories, advance contemporary understandings and propose future developments of design as a materialized form of critique. 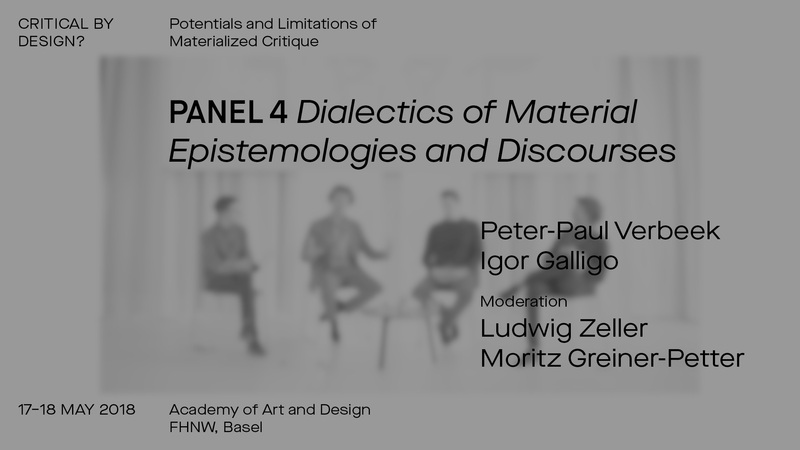 With the emergence of approaches such as Design for Debate, Critical and Speculative Design or Critical Making, among many others, the idea that design could be a material mode of critical inquiry regained an international and interdisciplinary visibility in the last decades. By now, a plethora of labels, schools and frameworks has established that aim to reclaim design as a critical practice. The specific conditions and boundaries of design as a mode of critical engagement and the various notions of criticality employed often remain implicit. Conceptual references to earlier radical and anti-design traditions or historic traditions of social critique have hardly been analyzed in greater depth so far. Furthermore, contemporary critical fields like feminist or post-colonial theories have only been addressed recently and by a small number of design theorists and practitioners. The conference therefore provides a platform to discuss the genealogies of criticality in design, to elaborate the specific capabilities and pitfalls of design-based critique and to infer implications for the further development of the field. Invited speakers include Jeffrey Bardzell, Shaowen Bardzell, Carl DiSalvo, Igor Galligo, Bruno Gransche, Moritz Greiner-Petter, Anja Groten, Søren Bro Pold, Alice Twemlow, Peter-Paul Verbeek, Matt Ward, Janneke Wesseling, Anne-Marie Willis and Ludwig Zeller. 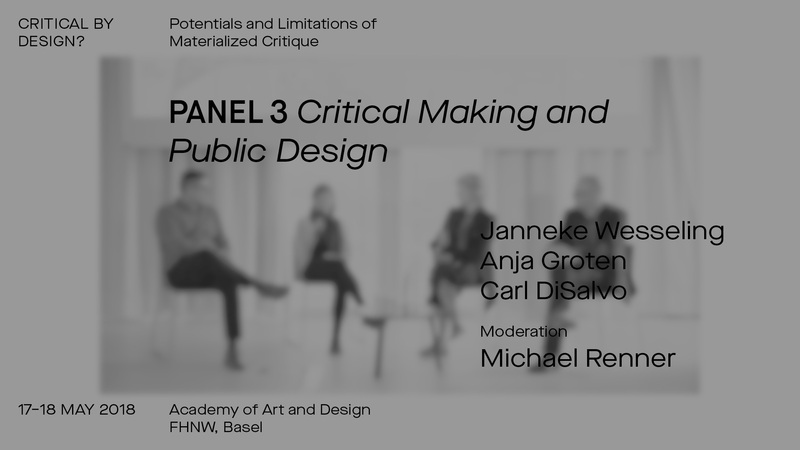 The conference was held on May 17–18, 2018 at the FHNW Academy of Art and Design in Basel and was organized by the members of the SNSF-funded research project Critical Artifacts. Jeffrey Bardzell is Professor of Informatics and Director of HCI/Design in the School of Informatics, Computing, and Engineering at Indiana University Bloomington. He is a critical scholar of HCI and interaction design, blending philosophy and theory on the one hand with social science on the other. He is known for his work in aesthetic interaction, design criticism, user experience, virtual intimacy, critical design, creativity support, making, innovation, and research through design. He is co-editor of Critical Theory and Interaction Design (MIT Press, in press) and co-author of Humanistic HCI (Synthesis Lectures in Human-Centered Informatics). He is working on a monograph that develops descriptive-empirical, epistemological-justificatory, and speculative-interventionist accounts of design inquiry. Bardzell's work is funded by the National Science Foundation and the Intel Science and Technology Center for Social Computing. Shaowen Bardzell is Professor of Informatics in the School of Informatics, Computing, and Engineering at Indiana University and the Affiliated Faculty of the Kinsey Institute. Bardzell holds a Ph.D. in Comparative Literature from Indiana University and pursues a humanistic research agenda within the research and practice of Human Computer Interaction (HCI). A common thread throughout her work is the exploration of the contributions of feminism, design, and social science to support technology’s role in social change. Recent research foci have included care ethics and feminist utopian perspectives on IT, research through design, women’s health, and posthumanist approaches to sustainable design. Her work is supported by the National Science Foundation, Intel Corporation, and the Mellon Foundation among others. She is the co-editor of Critical Theory and Interaction Design (MIT Press, forthcoming) and co-author of Humanistic HCI (Morgan & Claypool, 2015). She co-directs the Cultural Research in Technology (CRIT) Lab at Indiana University. Carl DiSalvo is an Associate Professor in the Digital Media Program in the School of Literature, Media, and Communication at the Georgia Institute of Technology. At Georgia Tech he directs the Public Design Workshop: a design research studio that explores socially-engaged design and civic media. DiSalvo’s scholarship draws together theories and methods from design, the social sciences, and the humanities, to analyze the social and political qualities of design and to prototype experimental systems and events. His first book, Adversarial Design, is part of the Design Thinking, Design Theory series at MIT Press. He is also a co-editor of the MIT Press journal Design Issues. DiSalvo’s experimental design work has been exhibited and supported by the ZKM (Karlsruhe, Germany), Grey Area Foundation for the Arts (San Francisco), Times Square Arts Alliance (New York), Science Gallery Dublin, and the Walker Arts Center (Minneapolis). Igor Galligo is initially trained in humanities, leading to three master’s degrees: contemporary philosophy and aesthetics at the University Paris 1 Sorbonne, and political science at the Ecole des Hautes Etudes en Sciences Sociales in Paris (EHESS). Since late 2012, he has developed his reflection on the topics of sublimation, epistemic devices, and the scattering of attention, under the direction of Bernard Stiegler, director of the Institute for Research and Innovation at the Centre Pompidou, where he directed three international seminars on the transformations of attention. In 2013, he joined the research program of “Reflective Interaction” at EnsadLab, the research laboratory of Ecole Nationale Supérieure des Arts Décoratifs. In 2015, he became research officer at the Ministry of Culture and Communication in the Department of Research, Higher Education and Technology. Since 2016, he enrolled a PhD in aesthetics and design at EHESS under the co-supervision of Jean-Marie Schaeffer (EHESS) and Claudia Mareis (IXDM). Dr. Bruno Gransche has been a philosopher at the Institute of Advanced Studies FoKoS at the University of Siegen since 2017. He works as a researcher and lecturer in the fields of philosophy of technology and ethics with a focus on artificial assistants, big data, shared autonomy, socio-technical cultural techniques, and future-oriented thinking. He is also head of the research group Philosophy of emerging human-technology relations. He is a research fellow at the Fraunhofer Institute for Systems and Innovation Research ISI in Karlsruhe, where he worked as a philosopher and Foresight expert until 2016. Recent publications include: Assisting Ourselves to Death – A philosophical reflection on lifting a finger with advanced assistive systems; The art of staging simulations – Mise-en-scène, social impact, and simulation literacy; The Oracle of Big Data – Prophecies without Prophets; Vorausschauendes Denken (The Foresighted Mind). Moritz Greiner-Petter is designer and researcher with a background in communication and digital media design. He holds a diploma in visual communication from the Berlin University of the Arts. Since 2013 he is junior researcher at the Institute of Experimental Design and Media Cultures (IXDM) at the FHNW Academy of Art and Design in Basel, where he conducts a PhD within the SNSF-funded research project Critical Artifacts. As a researcher and practitioner, he is exploring the interplay between the media aesthetics, materialities and epistemologies of information technologies from a design perspective. His practice is often characterised by critical engagements with the effects and defects of formats of all kinds, taking shape in experimental artifacts, prototypes, interfaces and publications. Anja Groten is a designer and researcher based in Amsterdam. Investigating the possibilities of frictional encounters as part of design practice, she designs collective moments of critical making, aimed at discussion, confrontation and contingency. Groten's design practice evolves around the cross-section of digital and physical media, design and art education and her involvement in different interdisciplinary collectives. Groten works on (self-)commissions and besides tutors at the Sandberg Instituut Amsterdam, and the Design Academy Eindhoven. In 2013 she co-founded the initiative Hackers & Designers, attempting to break down the barriers between the two fields by enforcing a common vocabulary through education, hacks and collaboration. Groten has lectured and given workshops at several art and design schools in the Netherlands and abroad, amongst which Changsha Normal University, City Design School and CAFA Beijing (CHN), Krefeld University of Applied Sciences (DE), University of Westminster (UK), Kunsthochschule Berlin Weissensee (DE), OCAD University Toronto (CA), Otis College of Art and Design Los Angeles (US), and University at Buffalo (US). Søren Bro Pold has published on digital and media aesthetics – from the 19th century panorama to the interface in its different forms, e.g. on electronic literature, net art, software art, creative software, urban and mobile interfaces, activism, surveillance culture and digital culture. His main research field is interface criticism which discusses the role and the development of the interface for art, literature, aesthetics, culture and IT. Together with Christian Ulrik Andersen he edited the anthology Interface Criticism (2011) and will publish The Metainterface – The Art of Platforms, Cities and Clouds on MIT Press in 2018. Dr. Alice Twemlow is professor of the Design and the Deep Future Readership at the Royal Academy of Art, The Hague (KABK), associate professor at Leiden University, and head of the Design Curating & Writing Master at Design Academy Eindhoven. 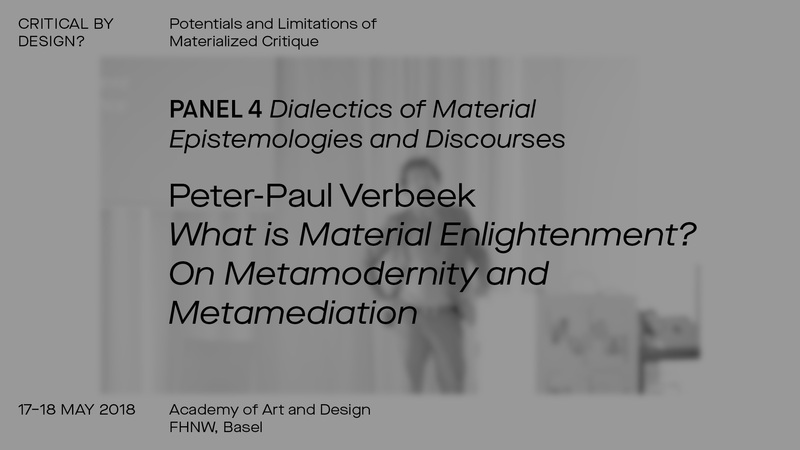 Peter-Paul Verbeek is professor of philosophy of technology at the Department of Philosophy and co-director of the DesignLab at the University of Twente, The Netherlands. He is also honorary professor of Techno-Anthropology at Aalborg University, Denmark. His research focuses on the philosophy of human-technology relations, in relation to philosophical theory, ethical reflection, and practices of design and innovation. Verbeek is a member of the UNESCO World Commission on the Ethics of Science and Technology (COMEST), the Dutch Council for the Humanities, the Responsible Innovation steering committee (Netherlands Organization for Scientific Research), and the Netherlands National Commission for UNESCO. In 2016 he was awarded the World Technology Award in Ethics. His publications include Moralizing Technology: Understanding and Designing the Morality of Things (2011), What Things Do: Philosophical Reflections on Technology, Agency, and Design (2005), Postphenomenological Investigations: Essays on Human-Technology Relations (2015, edited with Robert Rosenberger), and The Moral Status of Technical Artefacts (2014, edited with Peter Kroes). Matt Ward is the current Head of the Design Department at Goldsmiths in London. His research spans a wide range of interests from speculative design to radical pedagogy. He’s a practicing designer, writer and founding member of DWFE; a post-disciplinary, semi-fictional design syndicate. DWFE’s work searches for meaning in the construction of the extraordinary; they design activities, objects and incidents to reconfigure people’s perceptions. Ward has been a research affiliate to MIT Media Lab and Interaction Design at The RCA. He consults for a range of organisations; Nokia, BERG, Dentsu and the Design Council. He lectures internationally about design, technology and education. 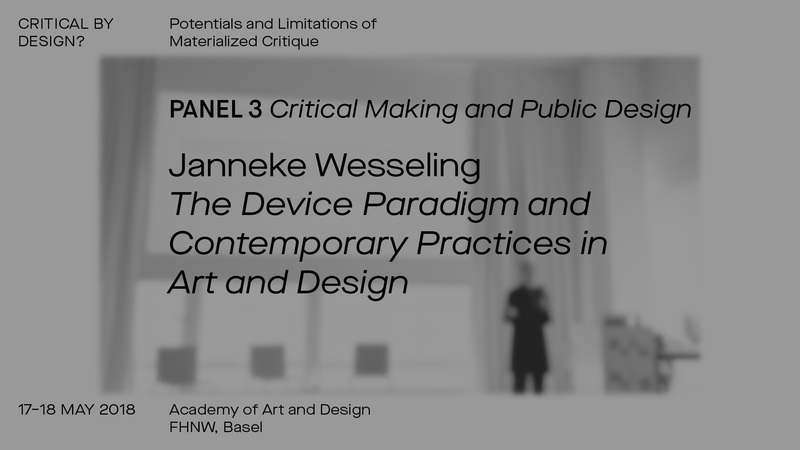 Janneke Wesseling is Professor in Practice and Theory of Research in the Visual Arts, at the Academy of Creative and Performing Arts (ACPA) of Leiden University, and reader in Art and Theory at the University of the Arts, The Hague. In 2013 Wesseling obtained a doctoral degree at Leiden University with a dissertation on contemporary art and reception aesthetics, entitled The Perfect Spectator: The Experience of the Artwork and the Topicality of Reception Aesthetics. Wesseling writes as an art critic for the Dutch daily newspaper NRC Handelsblad, from 1982 to the present. A selection of recent publications includes The Perfect Spectator: The Experience of the Art Work and Reception Aesthetics (Amsterdam: Valiz, 2017), Of Sponge, Stone and the Intertwinement with the Here and Now. A Methodology of Artistic Research (Amsterdam: Valiz, 2016), ‘Why Write? On Writing as Art Practice’ (in the Conference Catalogue of the Conference of the Society for Artistic Research, University of the Arts, The Hague, 2016), and See it Again, Say it Again: The Artist as Researcher (ed. Janneke Wesseling, Amsterdam: Valiz, 2011). Anne-Marie Willis is a design researcher, writer, editor and educator. From 2013 to 2017 she was Professor and Head of Design Theory at the German University in Cairo, and has held lecturing positions at University of Sydney, Monash University, Griffith University and UNSW. She has worked at senior level in design consultancy most notably as Assistant Director of the EcoDesign Foundation, a non-profit organization that pioneered sustainable design in Australia. She has published and lectured in popular and academic contexts on socially-engaged design, ontological design, urban cultures, inter-cultural relations, sustainability assessment, climate change, design scenarios/futures, visual culture and photography. She was a founder, and editor, of the online academic journal Design Philosophy Papers, and is the author and editor of five major books, most recently The Design Philosophy Reader to be published by Bloomsbury in 2018. Anne-Marie is now based at The Studio at the Edge of the World in Tasmania. Ludwig Zeller holds an M.A. in Design Interactions from the Royal College of Art in London and graduated in Audiovisual Media at the Academy of Media Arts in Cologne. His personal research puts a special emphasis on the narrative and imaginative processes of fictional design artefacts and scenarios and strives to explore new forms of speculation. As a lecturer at the Academy of Art and Design Basel (FHNW) he conducts seminars on the poetic exploration of our data cultures through audio-visual translations between analogue and digital, individual and collective domains. He is a frequent contributor to the design magazine form and has recently published a B1/B2 Manifesto for Critical and Speculative Design. Below you can find videos of most of the talks and panel discussions from the conference as well as abstracts for each lecture. A detailed program of the event can be found in the conference booklet (PDF). What Rhymes With Critical Design? Critical practices and design practices are both (at least) centuries-old. Further, as any design history makes clear, designing and criticality have often worked side-by-side. Dunne and Raby recently developed a distinctive practice that they called Critical Design, which has clearly resonated with many throughout the design world. Many researchers, myself included, have remarked that Dunne & Raby's Critical Design narrows both criticality and design in order to achieve a coherent practice. The risk–and I believe it is happening–is that the design community treats their specific practice as paradigmatic of the whole idea of designing with criticality, narrowing and even foreclosing the extraordinary potentials of criticality in design. In this presentation, I explore points where design epistemologies and critical epistemologies appear to “rhyme,” that is, where design practices and critical practices appear to be in alignment, though often with different vocabularies. Specifically, I offer a side-by-side analysis of design cognition and critical interpretation to reveal deep and surprising similarities. From this, I argue that we should not treat the intersection of criticality and design as if it were a specialized design subdomain, but instead that we should view criticality as a part of design and design as part of criticality. A role for design research, on such a view, is to develop theories and methods that open up ways of integrating criticality and design. The paper will present the metainterface as a contemporary interface paradigm in a time where the interface seems to evade perception, and becomes global (an abstract spatiality, everywhere, or “in the cloud”) and generalized (in everything – sealed off in anything we may encounter). This metainterface is the foundation of a culture industry in your pocket. Participation and sharing has become a business model of centralized platforms, that are also territorial, affecting how we see and use urban space, and global in their ways of reorganising sense perception through datafication and clouds. However, given the metainterface we see new art practices that question the material conditions of the metainterface, and point to alternative ways of construction and design. Although the metainterface is intrinsic to new cultural industries, a new de- and reterritorialization of the urban, and new experiences of global realities, there is no reason to take it for granted. Consequently, the paper aims to fuel new technological imaginaries and design paradigms. The paper presents case studies and discusses interface criticism by design in relation to a larger history of critical design, particularly the Scandinavian political tradition of participatory codesign, the Anglo-Saxon tradition of critical design, notions of apparatus and tactical media. How would Spotify look, if created by musicians? How would the Apple App store look if developed by software artists? What would Google look like if rewritten by digital poets? What would the metainterface be – if based on artistic techniques? In the design of digital interfaces, the supposed pliability and plasticity of digital forms is often countered by the discrete logics and structures they are based on and which they tend to import to the interactions and experiences they afford. Interfaces as representational regimes are the sites, where the materialities of computational artifacts are enacted and emerge in the interaction with users. They are spaces for negotiating the (im)possibilities for action and expression in dialogue with the formats, interaction potentials, representational capacities and embedded norms for use that they offer. The ambivalent materialities of interfaces thus bring about their very own resistances and affinities as design materials and fabricate the conditions for constant micro-frictions between user's residual intents and the degrees of openness of interface forms. To critically engage with digital interfaces could mean to foster a design of formats that are open to register the ambiguities of intentions without capturing it, and to embrace the nuances of experience and expression without their exhaustive exploitation. With Søren Bro Pold and Moritz Greiner-Petter. Moderated by Jamie Allen. While the material form of a designed entity can certainly be used to raise provocative questions, when it comes to conveying a more pointed or nuanced argument, language is often still essential. In this talk I discuss some aspects of the history of design criticism and the ways in which different critics, such as the 1950s American auto critic Deborah Allen and the 1990s British critical design pioneers Dunne & Raby have either engaged with, or eschewed, language in order to reach their intended publics. In the education of design criticism today, and in order to fully engage with the urgent issues of our era, I advocate for an expanded or hybrid writing practice that is sensitive to the literary qualities of critique but also takes into account and exploits its materiality. Can design contribute not just towards an incrementally better world, but to a radically better one? Can design alleviate suffering and increase human flourishing, rather than merely contribute to the false pleasures of consumerism? Such questions suggest the utopian nature of emancipatory design, and it inherits the problems of any utopianism: to construct actionable agendas, we must be able to imagine radically better social worlds and accompanying ways of life, but such imaginings are difficult or even impossible. In recent years, feminist utopian thinkers have taken up this challenge using a double-move: the first is a “diagnostic critique” of the present, which is leveraged in the second move “anticipatory design,” to imaginatively construe one or more aspects of the social world in a preferred and plausible way. In this talk, I will explore this double-move in the context of design, specifically a functional menstrual product called the Formoonsa Cup in Taiwan. The cup proposes and enacts concrete strategies that challenge and overcome unquestioned misogynistic cultural tendencies about the care and maintenance of the hymen in Chinese culture. In doing so, it also proposes an aspirational future for the women in the country, which in fact led to activism that helped bring that future into being. I argue that contemporary feminist utopianism represents a living critical/design practice: its double-move teases out glimpses of preferred and possible futures, which can guide and motivate democratic forms of activism in the present. With Alice Twemlow and Shaowen Bardzell. Moderated by Meike Hardt and Michaela Büsse. This lecture will be structured around four deaths; each significant in my life, each playing a role in shifting my understanding of life, death and design. The lecture aims to problematise the idea of ‘critical design’ as a school of thinking, a method or a style of design. I will try to grapple with the relationship between critical thought, theory and material practice in the networked age. Whilst doing this I will try to unravel how nomenclature and critique can undermine local cultures and how ‘care’ can provide a framework to make sense of a new direction in design education. The talk will reflect on design in perilous times through ideas, projects and practices that have emerged from Goldsmiths over the last 15 years. I aim to build a case for a new expanded, post-disciplinary practice. The main research question of the project Bridging art, design and technology through Critical Making is whether, in a technologically informed cultural field, the notion of ‘critical making’ can reinvigorate the concept of criticality in art and design theory and practice, and, conversely, whether art and design practices can radicalize the criticality of critical making. My lecture will focus on the concept of ‘device paradigm’ as developed by the American philosopher Alfred Borgmann in his Technology and the Character of Contemporary Life. A Philosophical Inquiry (1984). Technology promises liberation, enrichment, and the conquering of the scourges of humanity. The irony of it is, according to Borgmann, that liberation by way of disburdenment yields to the disengagement from the world of things. The device paradigm locates the crucial force that more and more detaches us from the persons, things, and practices that used to engage and grace us in their own right. Technological devices such as central heating plants, cars and mobile phones have the function of procuring or making available commodities such as warmth, transportation, or communication. A commodity is available when it is commodiously present instantaneously, ubiquitously, safely and easily. Availability in this sense requires that the machinery of a device be unobstrusive. i.e. concealed, dependable, and foolproof. The more, or the more effectively, the device yields its commodities, the less visible, or present as a thing it is. This necessarily leads to a loss of engagement with the world, while at the same time the commodities become evermore shallow. An important consequence of the technological dominance of everyday life is convergence: nature, man and machine have become ever more intertwined. Boundaries between lifeless mater and living nature are disappearing. What does the device paradigm mean for contemporary art and design practices? And vice versa, what can be the role of art and design in this technology driven world? From the perspective of design practice this talk proposes hands-on modes of learning about technology, calling into question tech-optimist notions such as innovation. Strategies of critical making¹ are hereby put forward as means to force quit (ctrl+c) and reevaluate accelerated technological processes. Practicing critically can be seen as practicing in a state of suspicion and alertness², a condition of not-yet knowing. Situations of collaborative making turn into sites for exercising positions: opposing, contradicting and confronting. Could design–through initiating and cultivating oppositional forces during making processes–move toward a breaking of habits and practicing of new critical routines? 1 Cramer, F, Evers, L, Helmling, A, Kuitenbrouwer, K, Sondeijker, M-J, Wesseling, J, 2017. Position Paper Critical Making, accessed 26 January 2018, http://www.criticalmaking.nl. 2 “(...) suspicion originally served a biological function as an aid to survival, priming us to be alert and vigilant (...). It is also directed to the future, anticipating and second-guessing possible motives, preparing us for dangers that have not yet come to view” Felski, R, The Limits of Critique, The University of Chicago Press, 2015. So-called smart cities are often promoted as offering new forms of civic participation, enabled by sensors, data, and digital media. But all too often, these visions of computationally enabled and enhanced civics simply reproduce familiar modes of governance with added efficiency. What else might a smart city be? In this talk I’ll share projects that explore different visions of smart cities, in which design works to stage experiments in civics that explore how we might live together, differently. Using participatory research methods with non-profits, local government, and residents we have been able to articulate and prototype a set of themes and concepts that offer insights into how the technologies and services of smart cities might be used to support more diverse civic practices. In addition to informing the design of systems, these projects also suggest new modes of designing and new subjectivists of design, that refigure what we might mean by critical and speculative design. As part of this talk, then, I will also reflect upon how a turn towards the experimental and the public also might bring about a turn in design practice. With Janneke Wesseling, Anja Groten, and Carl DiSalvo. Moderated by Michael Renner. In ‘What is Enlightenment?’ Michel Foucault developed an alternative account of modernity, in which he complements the transcendental concept of ‘critique’ with the empirical concept of the ‘limit attitude’. Instead of articulating a position outside reality, he paved the way for a ‘critique from within’. The fact that there is no place ‘outside’ the limits of our frameworks of interpretation does not make critique impossible: it rather implies that we should position ourselves at these very limits themselves. Critique then takes the shape of a ‘limit attitude’, aiming to investigate how we came to think the way we do, and to facilitate a reflexive relation to this. This limit attitude, as I will argue, is not only a matter of thinking but also of design. Taken in the literal, German sense of the word ‘Entwerfen’ means ‘un-throwing’, or: encountering the thrownness of human existence. From the perspective of the approach of technological mediation, this ‘thrownness’ typically includes the foundational role of technologies in human life. Technologies find themselves at the boundary between humans and the world, mediating how we experience it and engage with it, and therefore also how we understand and change the world. To radicalize this thought, I will connect this ‘material Enlightenment’ to the three questions that make up Immanuel Kant’s project of critical philosophy: the questions of ‘what can I know?’, ‘ what ought I to do?’ and ‘what may I hope for?’. The approach of technological mediation shows that technologies, as designed objects, help us to understand the world, to develop moral frameworks, and to experience limit situations. Not as transcendental conditions but as material mediators. Critical design, then, should invite a critical relation to these mediations. Not from a critical position ‘outside’ the realm of mediation, but by developing a limit attitude ‘from within’: mediating our relation to mediations. From the perspective of material Enlightenment, critical design is the design of metamediations. If the challenge of design is to invent and institute new forms of technical life, then critical design as a purely speculative design can not meet its cultural challenge. However, critical design can find a cultural positivity if it is integrated in a dialectic of invention, of which it represents only a negative phase, which must be exceeded in a new creation. The challenge of my talk will be to formulate a creative dialectic for critical design. For this, the philosophy of the technical and biological normativity formulated by the French philosopher Georges Canguilhem seems to me to be an interesting theoretical framework for rethinking a dialectic of exosomatization through a technicized conception of Freudian sublimation. For Canguilhem, design conceived as applied science, disregards its vital nature of practical experience combining work, control and risk taking on a background of adventure. This point of view is the basis of his concept of “negative values” which is in the same dialectical current as Gaston Bachelard who puts forward the concept of opposition in favor of contradiction. These values do not consist in the adaptation to norms imposed from outside but in the invention of new standards whose style, the technical scheme, Gilbert Simondon would say, is specified as and when they are exercised. If sublimation is traditionally defined by Freudianism as a delay in drive satisfaction resulting in an aesthetic creation, under the effect of moral and social constraints, I would like to show that Canguilhem integrates sublimation dynamics into an anthropotechnic that leads not only to a new aesthetic creation, but also to a new technical creation. With Peter-Paul Verbeek and Igor Galligo. Moderated by Moritz Greiner-Petter and Ludwig Zeller. Ontological Design, Criticality and What Comes After Design? I have argued that Ontological Designing (OD) is not the same thing as crude behaviorism; that it names neither the vague assertion that “we are conditioned by our environment” nor a simple stimulus-response model of “behavior-steering design”. Rather, the argument is that OD is a fundamental condition of being human, that is to say, we as humans are made by what we make; we design, and the things we design, design us. Ontological designing is thus an inescapable condition, and, once grasped as such, it changes how a designer understands what they are actually doing. Ontological designing, names a condition and by implication, a disposition towards design practice. In bringing OD to the ‘critical condition(s)’ of now and the future, unsustainability is exposed as a structural and structuring condition that has arrived accumulatively and largely unintentionally by design, and that now needs to be designed against. This cannot be done by deploying design as it is conventionally understood and practised. Yet neither are current forms of ‘sustainable design’ nor ‘critical design’ adequate to the challenge of engaging the condition of criticality of now. As digital technology becomes increasingly autonomous and embeded in economic, political, socio-psycho and cultural life, what possibilites remain for critical thinking and action? Is critical distance now an impossibility? What remains for design as design creativity gets subsumed by digital automaticity? What are the limits of critique and the limits of Critical Design? There is a need for new forms of critical practice that understand design as ontological, yet are not design-centric. What might this ‘design after design’ look like? The impossible, the possible, and the necessary are three modal domains. If one wants to learn about worldviews, ambition, skills, or self-efficacy of others, it pays off to analyze how they classify entities with regard to these domains. The extension of each domain varies historically, ideologically, and individually but the extension of the possible is the only one in which decisions and actions matter. The impossible and the necessary cannot be altered by actors. The possible can. Challenging these definitions is an act of modal criticism and a prerequisite to the shaping of futures. Throughout the history of philosophy, the entities belonging to these modal domains underwent significant changes: Aristotelian ontology differentiates between inalterable substances that inhere essential attributes and nonessential accidents; Descartes opposed the two substances res cogitans and res extensa; empiricism and sensualism foster experience and perception as epistemologically primary to substance; Kant positioned substance as the hypothetical persisting rest within the changes of perceptible qualities; phenomenology emphasized the givenness of the world for a consciousness and so on. These drifts predominantly follow one direction: from the eternal towards the alterable, from the impossible and necessary towards the possible. For the therefore increasingly growing domain of the “unnecessary and possible” I propose the term accidence. The histories of philosophy, of sciences in general, and of technological “progress” show an expansion of accidence. Criticizing the respective definitions of the necessary and the impossible is one driver of this expansion. Actual attempts to shape and design the newly possible informs the observer about the hypothetically possible and the actually possible subdomains. Critique and design, technological and social progress expand the accidence domain. The talk I propose will discuss this dynamic as well as its effects and challenges. If almost everything can be potentially different – what follows from that: a wider future or no future at all? With Bruno Gransche and Anne-Marie Willis. Moderated by Claudia Mareis and Michael Renner. Ethical questions have seen a remarkable rise in the design practices and theories over the last decades and have led to the emergence of numerous new design movements. When terms become paradigmatic it is time to examine their historical roots, discursive variations and ideological pitfalls thoroughly. The lecture therefore asks for the philosophical, aesthetical and sociological structures of ethics in modernity: what exactly do we think about when we think ethically and which role do these contemplations play in modern societies? By posing these questions it becomes clear that the numerous design movements that emerged with the rise of ethics can be split in three types of ‘thought collectives’: designing through, for and about ethical thinking. Viewed through this differentiation, practice examples of these three discourses can be queried for their specific intentions, strategies and aesthetics. We will see that these thought collectives have recently entered a mode of disciplinary competition for the interpretational sovereignty on how ethical design should be in an age of crises. This controversial situation can be used constructively for the methodological diversification and sharpening of design practices and theories in general. The conference is held as part of the SNSF-funded research project Critical Artifacts – Speculative and Critical Design as a reflective approach towards the design of technology that is led by Prof. Dr. Claudia Mareis and Prof. Michael Renner and is carried out by Moritz Greiner-Petter and Ludwig Zeller. The design research project analyses and extends understandings of how critical and speculative design artefacts such as prototypes and scenario stagings contribute to the critique and transformation of established value paradigms in contemporary and future technology development. It attempts to historically assess and further develop design approaches that aim at rendering alternative socio-technological narratives visible and experienceable by the means of material artefacts and their discursive effects. 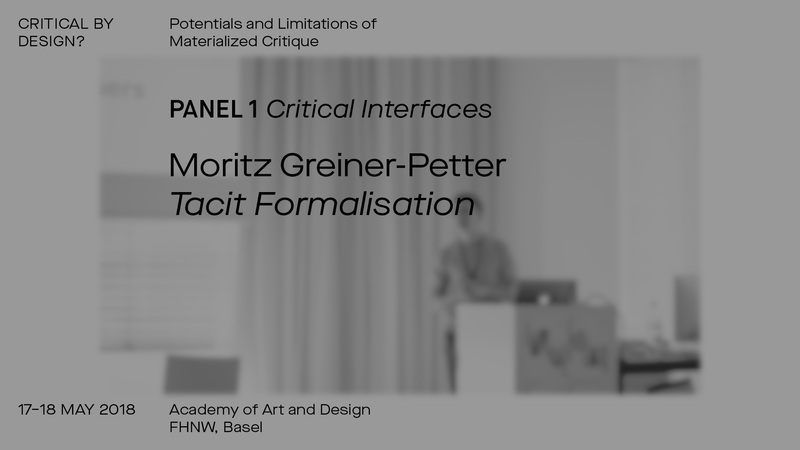 Critical Artifacts is a joint research project by the Institute of Experimental Design and Media Cultures (IXDM) and the Institute of Visual Communcation (IVK) at the FHNW Academy of Art and Design Basel. The conference is funded by the Swiss National Science Foundation (SNSF).